﻿UK & US Fathers Day: Calendar, History, Tweets, Facts, Quotes & Activities. Father's Day is the day to recognize, honor and celebrate the sacrifices and accomplishments of fathers. In 1910, Washington State Governor declared Father's Day on the 19th of July. It then became a permanent federal holiday in 1972 when US President Richard Nixon proclaimed that the third Sunday in June would be further known as Father's Day. 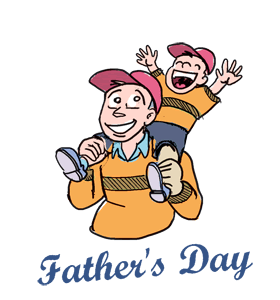 On this day, children celebrate their fathers and father figures to show their love and appreciation. In 1966, US President Lyndon B. Johnson declared the third Sunday in June as Father's Day. It became a permanent holiday in 1972 when President Richard Nixon proclaimed that the third Sunday in June would remain Father's Day. Mrs. Sonora Smart Dodd first came up with the idea for Father's Day after hearing a Mother's Day sermon in church. She was raised by her father and wanted to honor him. In 2014, 4% of all U.S. children lived only with their fathers. Attend a Baseball game. Father's day occurs in the midst of US Baseball season. Arrange a BBQ and invite all of the fathers in your family. Spend the day with Dad doing one of his favorite activities: fishing, golfing, hiking. Complete one of dad's chores or projects as a surprise. If it's something you don't know how to do, offer to help and learn. Take the President's Fatherhood's Pledge.